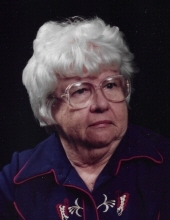 Dorothy Lee Ella (Casebier) Jandera, 99, of Perry, Oklahoma, went to be with her Lord and Savior on Friday, January 11, 2019 at Green Valley Nursing Home in Perry, Oklahoma. She was born to Ernest and Allie (Malone) Casebier on September 8, 1919 in Arcadia, Oklahoma. She attended Chappell Schools in Logan County, Oklahoma. Dorothy married Rudolph J. Jandera on July 15, 1939 by a Justice of the Peace in Enid, Oklahoma. She was a homemaker and helped Rudolph around the family farm near Orlando, Oklahoma. Her greatest joy was when she became a mother to Mary Francis in July of 1943. Eventually Rudolph, Dorothy and Mary Francis moved from the family farm and made their home in Perry, Oklahoma. Dorothy was preceded in death by her parents; her husband Rudolph in 1987; her sister, Ruth Cotton; her brothers Calvin Casebier and Ned Casebier. She is survived by her daughter Mary Francis Jandera and numerous nieces and nephews. Graveside services will be held at the Fairview Cemetery, south of Perry, at 2 p.m. on Wednesday, January 16, 2019 under the direction of Trout Funeral Home of Perry, Oklahoma. In lieu of flowers, memorials may be made to OU Children's Hospital in care of Trout Funeral Home, 1408 7th Street, Perry, OK, 73077. Memories of her life may be shared online at www.troutperry.com. To send flowers or a remembrance gift to the family of Dorothy Lee Ella Jandera, please visit our Tribute Store. "Email Address" would like to share the life celebration of Dorothy Lee Ella Jandera. Click on the "link" to go to share a favorite memory or leave a condolence message for the family.